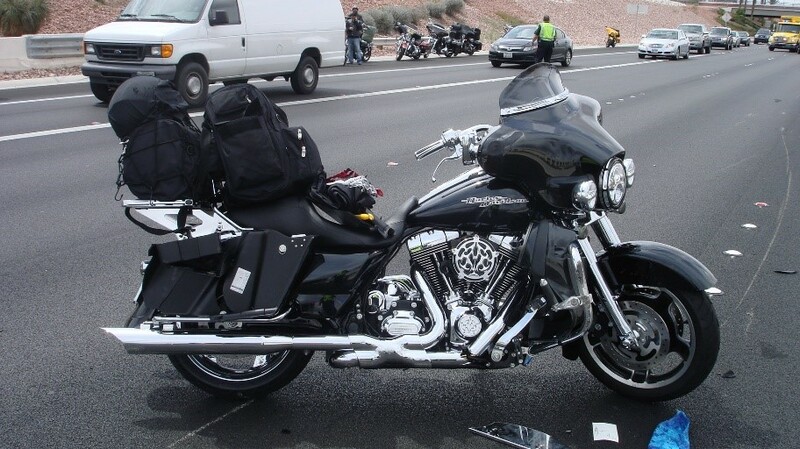 A motorcycle customization business faced a lawsuit after a motorcycle it had worked on crashed on an open section of freeway in Las Vegas, Nevada. The motorcyclist was on the first day of a riding trip and was accelerating to catch up to her riding group when she lost control of her motorcycle and crashed. The plaintiff claimed her crash and injuries were a result of improper fitment of a rear tire that was installed on her motorcycle just prior to her trip. It was argued the defendant installed a tire on her rear rim that did not provide sufficient clearance to the surrounding motorcycle parts. The plaintiff’s accident reconstruction expert identified tire rub marks on the inside edges of the rear fender and the inner edge of the drive belt. He pointed to this as evidence supporting the plaintiff’s argument that a problem with the motorcycle caused the crash. The accident reconstruction expert did not have an explanation of how the alleged clearance issue would have resulted in the loss of control experienced by the plaintiff. I was hired by the defense to analyze the crash dynamics and determine the factors that led to the crash. I testified that the physical evidence at the accident scene established the plaintiff was traveling 70 miles per hour when she lost control of her motorcycle due to rapid, successive, and increasing side-to-side movements of the motorcycle. The tire marks deposited on the roadway prior to the crash showed that the front and rear portions of the motorcycle were oscillating about the steer axis side-to-side at a rate of 2-3 times per second. These vehicle oscillations match a well-studied mode of motorcycle vibration associated with the self-balancing and self-aligning tendencies of motorcycles in forward motion. These vibrations typically occur at small, imperceptible amplitudes on a properly tuned motorcycle and therefore do not interfere with the operator’s ability to control the motorcycle. In this case, the vibrations grew to an uncontrollable level because the motorcycle was being operated in an unstable state. Then, to discredit the plaintiff’s theory, I showed the jury how the tire scuffs on the fender and drive belt were a result of the components contacting the tire when the motorcycle crashed onto its side. Like any mechanical system subjected to repetitive forces, motorcycles are susceptible to vibrations that can resonate. One way a normally stable motorcycle can be made unstable is by attempting to carry an excessive amount of luggage on the rear of the motorcycle. In this case, the plaintiff overloaded the rear luggage rack and the passenger seat behind her—areas in which cargo weight has a considerable destabilizing effect on the motorcycle. Warnings against carrying excessive weight were printed on labels attached to the rear luggage rack and the passenger seat-mounted luggage precisely for this reason. I testified that her failure to follow these warnings contributed to the unstable condition. She also did not follow the additional recommendations in her owner’s manual regarding carrying cargo, such as tire pressure and suspension settings that are very influential to motorcycle stability. I told the jury that this information is also presented in the motorcycle safety course that she had recently completed, along with information on how to respond to the signs of an unstable motorcycle. Even with the motorcycle in its unstable state, a crash likely could have been avoided had she slowed down upon first sensing the unstable condition, which she said she felt while traveling 55 miles per hour. Her last mistake was to accelerate to catch the rest of her group even though the motorcycle had given her a sign that it was unstable. The increased speed further reduced the damping of the vibrations, resulting in the control loss and crash. Contact Curtis for more information.